The egg on the left was made with an E hook and the egg on the right was made with an I hook. 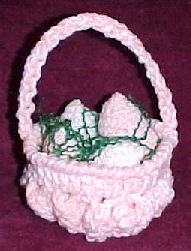 This is what the eggs look like in the basket with grass. Hook: Size I for large egg. ~ Size E for small egg. NOTE: This pattern is worked in a countinous round. BASE: Ch 2, 6 sc in 2nd ch from hk. Place marker (PM). RND 11: Sc Dec over next 2 sc (4 times), sk next sc, sl st in next sc. FINISH: Insert hook up through the egg to where you fastened off the yarn. Draw the yarn tail into the center of the egg to hide it. NOTE: You may need to shape the egg once finished, just work it in your hands till it looks like an egg shape.